Parties are known for alcohol consumption. 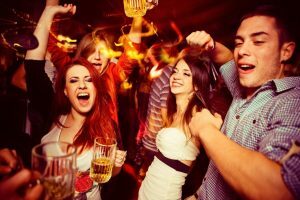 For recovering alcoholics, the idea of going to a party after rehab can be a rather daunting one. You might even be a little bit scared. This is fine: most people are worried their first time after recovering from alcohol detox. Being invited to social events where alcohol is present might make you think twice about going, about seeing other people. In order to help you, we’ve gathered a list of a few things you might want to keep in mind. Alcohol, indeed, may have had a huge influence and grip on your life in the past. However, remember that this is just what it is: the past. While it may be all around you at such an event, know that you are separate from it. Chatting, talking and having fun can all be done without drinking: you can even observe how your friends act while under the influence, and consider yourself lucky that you don’t have such a need anymore. If, for whatever reason, you do end up having a drink or even ending up on a massive binge… Don’t stress about it. Relapse is normal during recovery and even after. The important thing is to remember how to handle relapse. You may wake up hungover the next day, with fuzzy memories of the previous night and perhaps worrying you’ve done quite a few embarrassing things. Don’t worry. It’s over now and you can simply consider it a small trip-up in an otherwise smooth-going walk. Remember that you are a person with their own ideas and thoughts. If you feel the needs or the craving rise up again, you can make your excuses and leave. If you don’t want to reveal your detox history, simply make up another excuse. Say that you simply don’t feel well (which is the truth if you’re craving something you can’t have… you are simply not obligated to reveal the details). After detox alcohol is naturally going to be more tempting… and you may feel that you will be reprimanded by those who have helped you. As has been stated before, this isn’t the case: the support networks that you used will always be there. Understand this if you feel the need, the desire or the craving to come up again. It’s not just at parties. It’s in bars, it’s in grocery stores. You will see commercials for it on television. In fact, it is good to desensitize yourself to the fact that temptation will always be in your face. Once you realize that you are living each day with the temptation around you in some form, a party won’t seem as scary. Abstaining from alcohol is something you’re going to have to do your whole life. The goal here is to get better at it. There are many people out there in the same boat as you. Some are struggling from withdrawal from various other drugs; alcohol detox is only one type of recovery. Realize that you are not alone and that there are plenty of support groups. And of course, not only can you actually get support in these groups: you may end up making some lifelong friends in the process. The main thing to take away here is that you will get better at abstaining. Even after recovery, it is still something you need to work on and it is a technique that takes practice. Remember that no one is perfect and failure is normal; it is how you deal with failure that defines you.